Home » social media news » What journos asked the PM at BJP's Diwali Milan: may I take a selfie with you? Flocked by journalists at the 'Diwali Milan' luncheon at the BJP headquarters in Delhi, Prime Minister Narendra Modi was seen posing for selfies with the media representatives on live television for over thirty minutes. Just like the 2014 media meet, he was literally mobbed by journalists at the informal gathering. Soon after Modi hosted a luncheon for the media fraternity, #ModiMediaGate started trending on Twitter where many termed the entire event as a 'selfie circus'. Aided by Washington Post journalist Annie Gowen's allegation that the government is using PR agencies to influence foreign media, Twitter had a field day taking pot shots at media. We are curious why others still haven't. Perhaps because of the criticism from senior journalists and others. 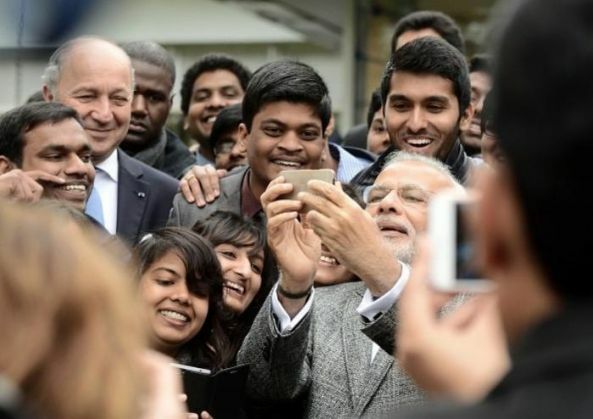 Feeling embarrassed watching Indian journalists scrambling over Modi to get a selfie with him rather than asking him important questions..
Modi meets UK press: gets asked uncomfortable questions.Modi meets Indian press: gets bombarded with selfie requests. This is the media we expect will ask tough questions of this government? Great visuals of an undignified selfie circus!!! 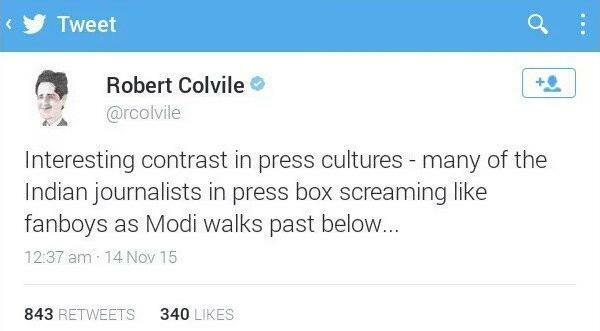 On 24 November, Robert Colvile, a well-known author, tweeted, "Interesting contrast in press cultures- many of the Indian journalists in press box screaming like fanboys as Modi walks past below...", highlighting the difference in media culture, which was yet again proved today. READ NEXT >> Anil Vij opposed Ashok Khemka's transfer by BJP, but then why punish Sangeeta Kalia?